It's the last Friday of the month, and you know what that means - it's time to go blog hopping InStyle Stamps! Our theme for this month is Back-to-School, and of course, we have some fabulous new images to help you celebrate getting the little munchkins out from under your feet! As usual, we will have some great prizes to give away, so make sure to read all the way down to the bottom of the post to see how you can get entered into a drawing for some great goodies! For my project, I made a cute little backpack for a co-worker with two children who will be returning to school soon. You can find the pattern for the backpack here. 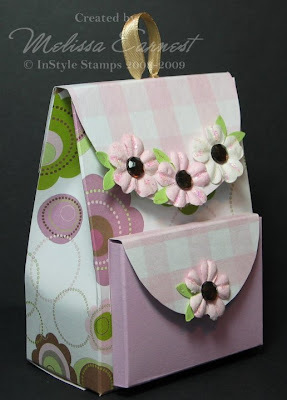 I used Circles and Posies and pink gingham (coming soon!!!) digital paper for my pack. Isn't it pretty? Here's a side view so you can see the ribbon "straps". Now, what's a backpack without something to go in it? When I was in grade school, my mother would always tuck little notes into my lunch box, so I've included four little 3x3 notes inside the backpack for her to use for her children. I used Janice and Jacob, and the soon to be released school house for her cards. Aren't they cute? I hope she likes them! We will be giving away a Grand Prize to one lucky Blog Hop participant and also have a prize for one lucky design team member. To enter, hop through the design team’s blogs (you can find them in my sidebar), and then go to the InStyle Stamps blog and vote for the designer who's project inspired you the most. (You're going to vote for me, right? LOL!) The leave us a comment on that post in order to be entered into the drawing for the grand prize. InStyle Stamps is currently searching for a new design team for the September 2009 – February 2010 term – could this be you? We are interested in fresh, funky and fun designs. We are looking for artists with great coloring techniques and photography skills, who have the ability to think outside the box and post regularly on their blogs. If you fit that mold, please apply for one of our team positions. 7. Tell us which team you would like to apply for: Anime, Retro, Digital. If you are applying for more than one, please list teams in order of preference. 8. 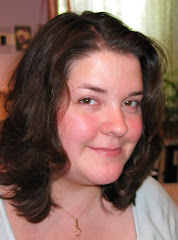 A brief “about me” summary to include; interests, crafting history, etc. Whatever you would like us to know about you and your experience. We should receive all submissions no later than August 25th, 2009 by 11:59 pm EST. 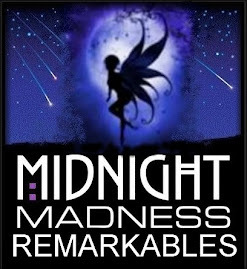 The new design team will be announced at the blog hop on August 28th. Your Design Team duties will last for a period of 6 months (September 2009 – February 2010). As a part of the InStyle Stamps team, you will receive a selection of images to work with each month. 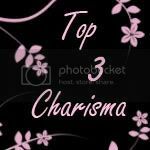 You are required to post a minimum of 4 projects per month (one per week) to your blog using the images provided. We require one non-card project a month. Please note that all images are provided digitally, so the ability to print the images is a must. Please do not apply if you are not comfortable working with digital stamps. 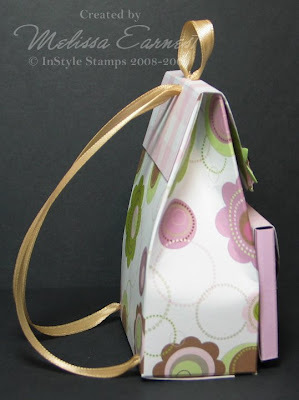 As a DT member, we would like to see you posting your creations in online stamping community galleries, such as at Splitcoast Stampers or Paper Craft Planet. This will help to increase exposure to our stamps and images. 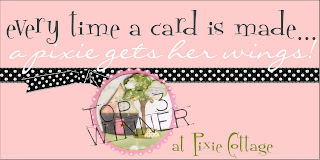 You get a badge to display on your blog to show that you are apart of the InStyle Stamps DT!! Every month you get 6 digital stamps to design with as well as our monthly Club kit. The projects you create as part of your design team requirements are yours to keep. You get a 50% discount on website purchases, for as long as you are on the design team. You will receive a welcome package with lots of goodies to get you started. I have exciting news to share! 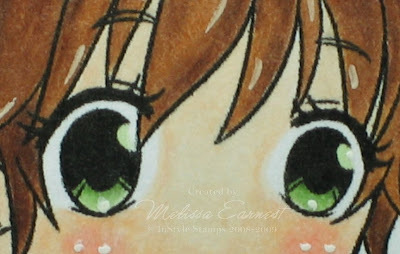 I've been invited to be the guest designer for today's challenge on the Copic Creations Challenge Blog, which will feature my eye coloring tutorial (see previous post)! I feel very honored to be invited to join these amazingly talented ladies! This week's challenge is to use your Copic markers to color eyes, and is sponsored by InStyle Stamps. 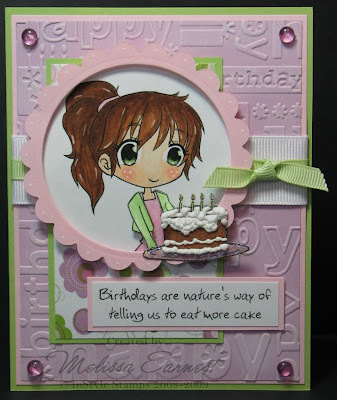 For my card, I used the digi version of Mellie by InStyle Stamps. Using the digi version allowed me to enlarge the image to show off those gorgeous eyes. I also used my photo editing program to mirror the image so that Mellie is holding her cake the right way to work with the layout I wanted to use. Try doing that with a traditional stamp! I printed two copies of Mellie, and used just the jacket and the cake from the second image to give the card a 3D effect. 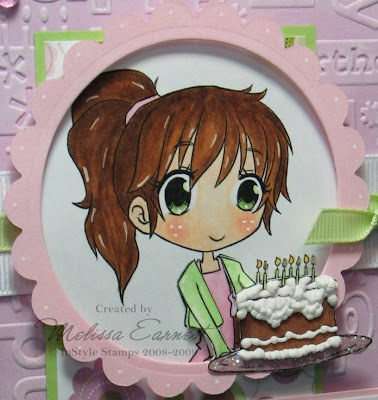 The shoulders are attached to the main image with a dab of 2-way glue, and then the arms are popped up on a foam dot to make it appear that Mellie is holding the cake out for the birthday girl to blow out the candles. The yummy chocolate cake was given white Liquid Applique frosting, and then I added a touch of star dust Stickles on the platter and the candle flames for a bit of sparkle. Thanks for stopping by! Be sure to go check out the lovely creations by the amazing Design Team at the Copic Creations Challenge blog. If you’re new to Copics, or just want some pointers, you’ll love all the Copic tutorials that can be found there.